I know how you all like a bargain. 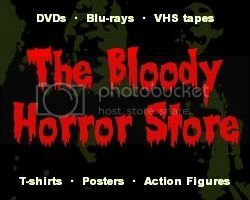 I also know how some of you live vicariously through my trips to the pawn shops and other retail establishments as I go in search of cheap horror DVDs. This time, I went to Target to see what I could find. Although the selection at Target was considerably better than the 20 or so titles in the horror section of Best Buy (which actually has a few good $4.99 deals at the moment), the only thing I left with was the "Drive-in Cult Classics" collection which is currently on sale at $9.99. Very appropriate since, according to Google, June 6th is the 79th anniversary of the first drive-in movie theatre. Isn't the artwork lovely? Well, no, but I suppose it'll do. I'd thought about getting this pack a few times before, but this time, I had $3.80 back from my recycled cans (yes, all Monster energy drinks) which sweetened the deal even more (especially as I already had a few of the films in other Mill Creek Entertainment packs). Mill Creek have been releasing these mostly "Crown International" movies since they took over BCI's catalogue. There are quite a few more sets which again repeat some titles and/or add a few more. Whether you buy them depends on what you are looking for specifically or if you just like collecting Mill Creek packs (as I do). On my travels, I've seen "After Dark Thrillers", "Dangerous Babes", "Gorehouse Greats", "Cult Terror Cinema", "Girls, Guns and G-strings", and "Savage Cinema", but it's very likely that there are others. 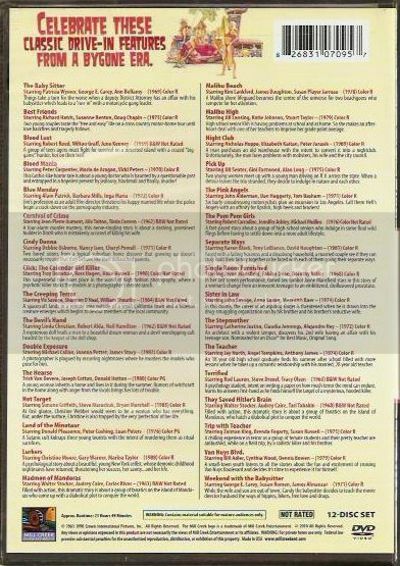 Here is a scan of the back of the "Drive-in Cult Classics" pack (albeit with some of the titles incorrectly labelled) so you can see what it looks like. I know it's not that exciting. The DVDs inside do not contain the movies in the same alphabetical order which is a little bit annoying. I probably don't need to mention that they aren't the greatest transfers either, but I will since these are probably the only transfers of these films available anyway. Since that second scan is hard to read, here are the now corrected titles (again in alphabetical order). The horror movies are highlighted in bold. I don't really know if any of these movies were ever shown in a drive-in cinema, and I'm pretty sure that most of them aren't actually "cult classics", but the collection had to be called something. It's better than "The Bumper Pack of Crappy Movies Which You've Never Heard of Before". Of course, only a small percentage of these movies are horror, but since only 5 of them were in the "Gorehouse Greats Collection" (Blood Mania, The Devil's Hand,The Madmen of Mandoras, Terrified, Trip with the Teacher), I thought it was still a very good deal. I haven't had time to watch any of them yet, but I'm sure I will when I've run out of modern movies later in the year. I don't have cable TV or Netflix anymore, I don't leave the house unless I really have to, and obviously, I get bored a lot. That's my excuse for buying these Mill Creek Entertainment packs of terrible movies, and I'm sticking to it. I also like the cover-art, such as it is. It appears that you can also buy these "Drive-in Cult Classics" in other smaller packs for exactly the same price if you are careful. Some of them are from Mill Creek Entertainment and some are by BCI with exactly the same artwork just to confuse you. Just don't buy the BCI issued "Volume 4" as it has nothing worthwhile on it, it's out of print, and greedy sellers are now asking ridiculously high prices for it.